Our clinical study results measuring effectiveness are the highest ever obtained with a non-prescription product! If you read the web sites of some other products you will notice that they speak of clinical studies that have proven the wonderful benefits of human growth hormone. However, they are referring to clinical studies that were done using the injections, not their own non-injection product. The vast majority of products on the market have had no clinical studies to show whether it is effective at increasing human growth hormone in the body at all! Randomized, double-blind placebo-controlled IGF-1 clinical studies are the medical standard for measuring the effectiveness of HGH therapies in adults. They measure any change in the test subject's IGF-1 level, since it reflects the amount of human growth hormone in the body. Some companies claim to have done their own studies. For instance, there is one company that claims they measured HGH release right after a person ingested their first dose of their amino acid product. The problem with this type of study is that it does not show whether the result is sustainable past the first dose! We already know that the pituitary gland can become resistant to stimulation using mega doses of amino acids, and so they should have done the study over a period of months, to see if their product still stimulated the pituitary gland as well as it did when the person first took it. I suspect they have not done any such study for that very reason. Those who offer the oral amino acid type pill and powder products that must be absorbed in the stomach may give information about general clinical studies that were done on a certain ingredient or ingredients in their product but those clinical studies were not done on their specific product, so they have no proof that their product is effective. Also, the products that are made up of amino acids do not contain the same amount of each certain amino acid that was used in the clinical studies. Some of the individual amino acids that were used in clinical studies to try to stimulate the pituitary gland to release HGH were given intravenously (IV) and not by mouth, and so it should not be assumed that those amino acids would have the same effect after going through the digestive process. Lastly, as stated above, it seems that when amino acids are taken in large doses the pituitary gland becomes resistant and so no longer responds the same. That is why you won't find any legitimate clinical studies that measured amino acid pituitary stimulation over a period of months. I have spoken with many people over the last 19 years who have told me that any benefits they experienced when they first began taking amino acids did not last, and after about 3 months they were looking for another type of product. Since they cannot show that their product is rated #1 by proper clinical studies some companies and distributors have built themselves their own "HGH consumer and product rating web sites" so they can claim that their product has somehow been rated #1 by someone. 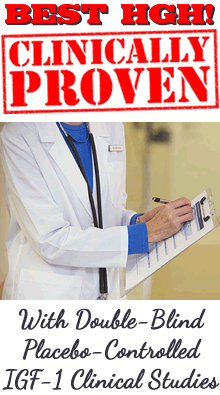 See Fake HGH Product Ratings for more information about these sites. Those selling products with no clinical studies to measure effectiveness use all sorts of hype such as claiming that sprays don't work, or claiming that their product contains more nanograms (ng) of HGH and many other untruths. Before leaving please click false claims to learn the truth about all the sales hype and untruths being used to sell unproven HGH products. Other Brands no IGF-1 clinical studies! 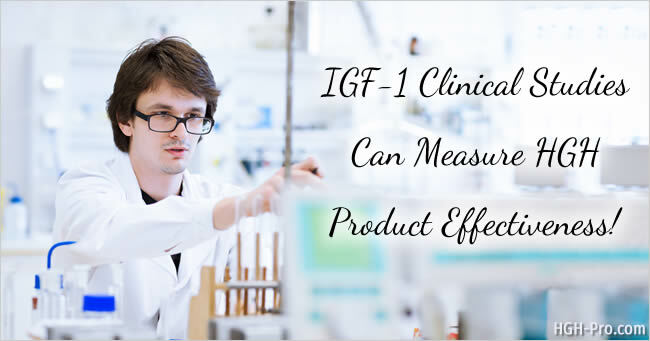 *More information about our independent IGF-1 clinical study results. More information about the clinical studies of other products. Some web sites may mention clinical studies, however, if they do not show the results or give the doctor's and facility's names (where you can read the names), or if the studies are not double-blind placebo-controlled or not independent they are not seen as legitimate. Some may also try to downplay the importance of IGF-1 clinical studies but don't let them fool you. The best human growth hormone product is the one shown to have been the most successful at increasing IGF-1 back to a more youthful and healthy level in test subjects and that is the product I take and recommend.